By forming an international community of Arabian horse breeders, we seek to preserve the standards of this ancient breed. Through educational offerings with foremost experts in Egyptian Arabian breeding, such as our annual Egyptian Event Seminars and the illustrious National Egyptian Breeders' Conference, we ensure opportunities for our members to continually learn, grow, and adapt. 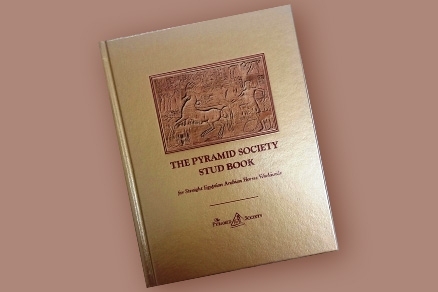 With key resources available through our website and within our sought-after breeders' publications, such as The Pyramid Society Standard of Excellence and The Reference Handbook of Straight Egyptian Horses, Volume XII, The Pyramid Society has a truly global reach, uniting members and keeping them abrest to the latest trends. To ensure this breed of legend continues to thrive today, we seek to perpetuate Egyptian Arabian bloodlines of the highest caliber. Through unique breeders' programs such as the incentivized Egyptian Breeders Challenge, Golden Scarab Sweepstakes, and Pyramid Society Futurity classes at The Egyptian Event, breeders are highly rewarded for producing the next generation of champions and champion-producers. As guardians of the breed, The Pyramid Society and its members work to guarantee the future of the Egyptian Arabian horse. By sharing the breed on a global scale through marketing and outreach, we seek to promote the popularity of the Straight Egyptian horse. Our webste is designed as the premier tool for publicizing members' farms, horses and breeding programs. Our widely-circulated publications, such as the semi-annual Pyramid Report (reimagined in 2014 as THE SOURCE) present historical and modern insights to readers across the globe and provide unparalleled opportunities for Pyramid Society members to advertise. And The Egyptian Event, the world's largest showcase of the Egyptian Arabian horse, continues to attract more and more attention to the breed each year.